UMass-Dartmouth this past week by a score of 8-1. Their overall record falls to 2-4 and 0-1 in league action. 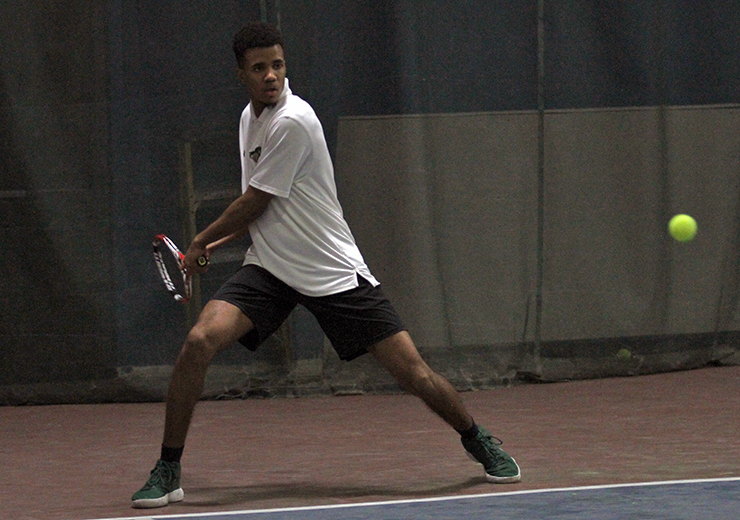 Junior Igor Almeida led the team in both matches, winning 6-0 and 6-2 against Norwich, 5-7, 6-4, 6-3 against UMass-Dartmouth in singles, and lost 8-5 against Norwich and 8-2 against UMass-Dartmouth in doubles with teammate Jared Wheeler. Freshmen Levi Williams, who lost both his single and double matches against Norwich and UMass-Dartmouth, said that the team is really young, but that overall they are having a lot of fun. Head coach, Bruce Moreton said that it’s been a good year, and that he is excited for next year as only one of their players is graduating. The men’s tennis team takes on UMass Boston on April 6. at home. This will be their third conference matchup this season. The outdoor track and field season has gone off to a fast start. Two school records have already been broken, and some athletes are already qualifying for regionals. Freshman Nate Gilcris broke the school record for the high jump with a height of 1.90 meters in his first collegiate meet. That put him in first place for the event at the Wesleyan University Spring Classic and qualified him for regionals. Clayton Bailey also won the javelin event at the meet with a throw of 43.09 meters. 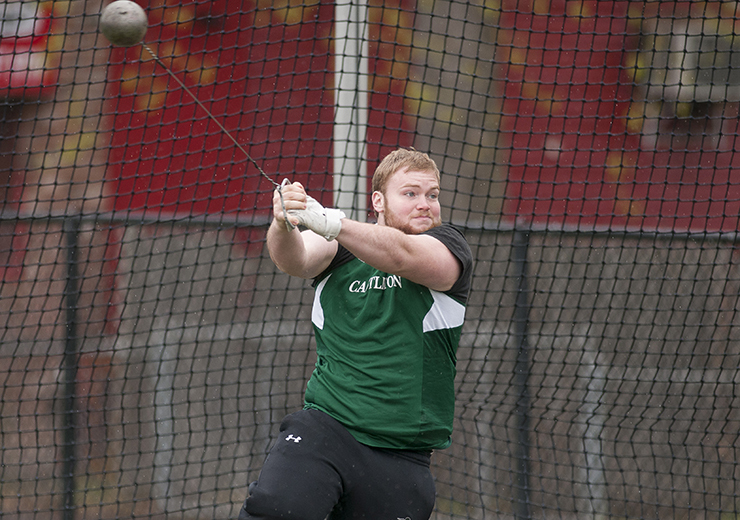 At the Saints Ice Breaker Open at St. Lawrence University, senior Tayler Larmie broke his own school record in the hammer throw with a distance of 46.63 meters, and as a result, qualified for regionals. The men’s team finished third overall at the Spring Ice Breaker Open last weekend. As for the women, Ashley Darrell set the school record in the 5,000-meter run with a time of 23:01.43 at Wesleyan. Ally Stearns then had a strong performance in the hammer throw at the Spring Ice Breaker Open. She took first place with a distance of 41.46 meters, qualifying her for regionals. Track and field will compete next at the Jim Sheehan Memorial Invitational at Fitchburg State on April 6. 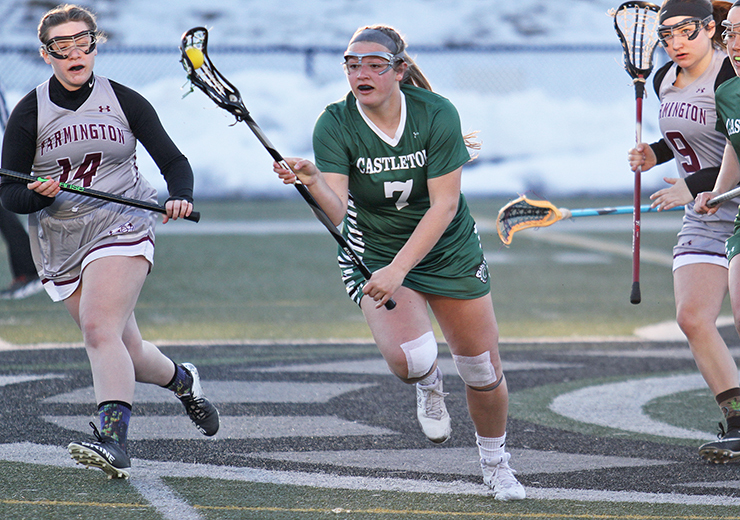 Castleton women’s lacrosse has had a decent start to their 2019 season. They currently sit with a 4-4 record, and they won their only Little East Conference match at Umass-Dartmouth giving them a 1-0 conference record. The Spartans dominated that game, beating Umass-Dartmouth 18-9. Castleton scored the first six goals of the game, setting the tone for the rest of it. Morgan Derosia and Emma Best each had six goals. Best leads the team in goals for the season with 21 and points with 25. Derosia and Erin Shuttle each have 13 goals on the year. Derosia also has nine assists, but Megan Wood leads the team with 10 assists. After a three-game losing streak, in their first fours games, the Spartans have won three of their last four games. They hope to keep the momentum going on Wednesday, April 4th at 4:00 p.m. at Colby Sawyer.